IEEE Pakistan WIE Forum is initiated and planned by IEEE-WIE GCUF AG, winner of Best Branch Affinity Group Award 2008-09 by WIEC. It is great honor for Pakistan that this award has won very first time by any branch AG from Region 10(Asia Pacific). It is also appreciated that all prize money of this award was spend to organize the “National WIE Summit 2010” to create opportunity for all WIE members across Pakistan to interact with each other technically as well as socially and to initiate the IEEE Pakistan WIE Forum. 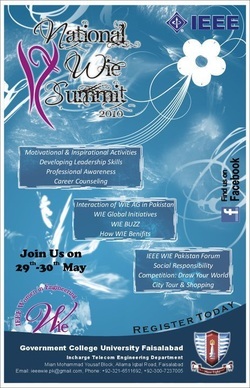 National WIE Forum 2010 was successfully executed on 29th-30th May 2010 at GC University Faisalabad under IEEE Lahore Section. The objective of this summit was effectively achieved. Amir Zahoor Student Section Representative (SSR) IEEE Lahore Section plan and set initial focus area of this forum with Mehvish Zahoor, Saad Zafer, Hamid Saeed, Syed Muhammad Azzam, Madiha Arshad, Madam Farah Batool, Syed Zeeshan Haider and IEEE Student Activities Committee, Lahore Section. The vision of this forum is very clear, to integrate all t h e Pakistan Science and Technology institutes, to create opportunity especially for females, represent the soft image of Pakistan, promote Pakistan as progressing nation, to activate the student for social issue & development, honor our values and traditions.